My grandchildren and I enjoy playing the “match game”. Spreading out 36 cards with 18 matching pairs, we take turns trying to find the matches among the face down cards. If you find a match you are rewarded by getting another turn. My grandson is particularly talented at this game and can frequently have a run of four matches in a row. When we begin playing the game, we have no idea where each of the cards is located among the 36. This means we frequently do not turn over the correct card the first time. However, we might remember by our next turn, correct our mistake, find the match and be rewarded with another turn. I have found this to be true in my own life as well. When life presents with opportunities for faith, I don’t always turn over the “right card” the first time. Sometimes it even takes a turn or two before I remember the lesson and choose to pick up the card of faith and obedience. I have even joked with my husband before that, with so much Greek blood in my veins, he has to “let me be mad” a little bit before I forgive someone, or choose to accept circumstances I don’t like. The truth of the matter is, the Lord wants us to turn over the “right card” each and every time, the first time. And He has given us everything we need to do so. When I play the Match Game with Jackson and Emma, I sincerely want them to win. I love to see Jackson find his four matches in a row. I love to see Emma studiously pour over the cards, as if she will be able to see the other side of the card if she just looks long enough. If my pile of “matches” has no cards in it, I am satisfied as long as theirs is piled high. This is the Lord’s attitude toward us. He has given all that we might have that same all which He gave up. The Lord wants us to succeed, He wants us to “. . .grow in grace, and the knowledge of our Lord and Saviour Jesus Christ,” (2 Peter 3:18). He delights in our steps of obedience and faith toward Him and not only does He desire to shower us with blessings, He already has. So as we approach each day, let us seek to turn over the right card first, and quickly, too. Let us seek to be about "our Father's business" of faith and obedience, knowing that each turn of the cards will lead to another chance, another opportunity to trust our Lord and to see His faithfulness and love. In the Dark and Silence. . . Noted Alabamian Helen Keller once stated, "I thank God for my handicaps. Through them I have found myself, my work, my God." Helen Keller wrote 12 published books and multiple published articles. She was a political activist and traveled the world as a lecturer. She was awarded the Presidential Medal of Freedom, one of the United States' highest two civilian honors. This is impressive, but it is more impressive when one realizes that at the age of 19 months, as the result of an illness described by doctors as "an acute congestion of the stomach and the brain," Helen was left blind and deaf. She was trapped in a world of darkness and silence. Helen might have stayed in her world without language had it not been for twenty year old Anne Sullivan,who taught her sign language and opened up the world for Helen. Although not as visible as Helen's disabilities, sometimes we allow our own persecutions, trials and difficulties to trap us in a spiritual world that appears dark and silent. Not that we are blind or deaf, but we grow blind to the thousands of ways the Lord expresses Himself to us every moment, in and around us. We are not deaf, but we can't hear those He has given to us as the safe counselors to whom we should be listening. How often is our speech sprinkled with the words "I", 'me" and "my"? How often to we actively seek to take the attention off ourselves and seek out information and knowledge about those around us? Helen Keller needed Anne Sullivan to take her attention out of her lonely and dark isolation and put it on all the things around her. Only then could she really "see" and the light shone brightly in her mind. her world was opened up to her. It was said Anne Sullivan was exhausted because Helen would not rest until Anne had "signed" to her the name of every object Helen could reach. Let us attempt to exhaust an inexhaustible God by seeking all there is to know of Him and then asking Him to reveal to us all there is to know of Him in our world. Like Helen, may our "eyes" be opened to all around us that we have failed to see. May we touch them in a new and different way and in doing so, may we touch our world. The story of how Anne Sullivan broke through Helen's isolation has become widely known through the dramatic depictions of the play and film The Miracle Worker. The "breakfast scene" in The Miracle Worker is eight minutes of the best acting ever performed on screen. As hard as it must have been to perform for the camera, The Miracle Worker also had 719 performances on Broadway. I was passing by a new business on a corner near our house recently. Men were outside pouring the concrete sidewalk. Since I was stopped at the traffic light, I had a few minutes to watch the men in action. The concrete flooding out of the end of the mixer was wet and full of small rocks, or aggregate. The men were using their tools to push and pull the concrete into a wooden form. Eventually, with enough pushing and pulling, the concrete will fill up every little space inside the form. When the concrete has all been poured, the men begin to smooth out the top of the concrete so that none of the rocks are protruding from the surface. Then the concrete is left to set up. Once it is finished it will be as hard as, well, concrete. If the men had not first created the wooden form, when the concrete was poured, it would not take the intended shape. In fact, the flowing concrete would be almost impossible to control. It is the form which makes it possible to end up with a slab of concrete in the shape of the original form. We too, are being shaped into another form. . .or conformed, if you will. Today we enjoyed the beautiful Spring weather to sit outside a local restaurant at some tables they had placed for their patrons. The sky was blue and the sun shining brightly. As we enjoyed our coffee and treats, Glen was busy reading and I was listening to the birds in the nearby bushes and trees. In spite of our presence they were busily singing. They twittered and tweeted to each other (and needed no hand-held devices to do it, either) and I enjoyed the beauty of their song. There was a tree nearby still bare of leaves and I could easily see the birds perched among the branches. I marveled at them being willing to sit so close to us -- almost as if they were there to give us our own little concert. Blessing, and honour, and glory, and power, be unto Him that sitteth upon the throne, and unto the Lamb for ever and ever." Imagine every creature praising the Lamb. But isn't that what they do today? When the birds sing, are they not singing praises to their Lord? When the insects make their tiny insect noises, aren't they giving honor and glory and blessing to their Creator? When the whales sing their huge and glorious song, to whom do they sing? They sing to the King of the universe, the One of whom it was said that "all things were made by Him; and without Him was not any thing made that was made." So why do the birds sing? They sing to glorify the Lord Jesus, the Lamb that was slain, the One that was found Worthy. Bloom Where We Are Planted. . . It has survived through hurricanes and almost drought conditions. It has lived with total neglect. Each year I expect to find it dead, and each year it continues to surprise me. About fourteen years ago, our dear friend J.J. gave our youngest daughter, then about six, a rose bush to plant. Our daughter Emmie had expressed some interest in growing plants and since her middle name is Rose, the choice of flower was obvious. She and her father picked the site for the bush, they dug the hole and planted the tiny rose bush. At first I guess the bush received some attention, but not for long. A rose bush doesn't hold much thrill for a six year old and it doesn't demand much attention from a busy preacher. For all I have heard of persnickety roses, I didn't give the rose a chance at surviving one year, much less fourteen. Yet, starting about March of each year, this neglected little bush begins to create roses of the most beautiful color, most of whom are perfectly formed with a gorgeous fragrance. You really couldn't ask for much more from a rose. The roses continue on until fall. Since we rarely have a hard winter, we will often find a deep pink bloom on the bush even in December or January. What is it that makes this neglected little bush bloom with such beautiful roses? It is quite simply doing what the Lord told it to do. It is fulfilling the eternal purpose He created inside the rose bush. . .to grow roses. The bush didn't ask if it had the perfect situation or surroundings. It didn't ask if there would be an abundance of people to care for it and then to admire the results of its actions. Once planted, it simply went about doing what the Lord put into it to do. Ah, may I learn from the little rose bush. May I bloom "where I am planted" without first expecting the perfect situation or circumstances. May I not care if there are people to take care of my needs and desires or to admire the results of my actions. May I only seek to do what the Lord has worked in me to do, to seek to fulfill His eternal purpose in me through Christ Jesus. May I be content, like the little rose bush, to bloom as long as He gives me season, to His glory and His glory alone. To the Lord Alone. . . The campus of the hospital where I work has been planted with many Bradford pear trees. I love these trees. In the fall, I love their fiery red leaves. In the spring I love their tiny white flowers. The thing I love best about these trees in bloom is not when they are full of blossoms, however, it is when the tiny petals begin to turn loose and cover with ground with a blanket of white. The ironic thing is that this only happens once the blossom begins to die and the petals let go of the tree. Then they become a soft, beautiful carpet for my feet. What a simple and beautiful lesson of the Christian life from the Lord's creation this is for me. The path of the righteous is the path of humility, the path of the lowly and meek. In a favorite book of mine, a young character learns by everything around her in nature that it is "good to go low", that humility is better than pride. She hears the sound of the bubbling brook as it rushes downward toward the sea. She sees the droplets jump with joy as they fling themselves with elation lower and lower. Their joy is in the humility of lowliness -- in being just what the Lord has created them to be, nothing more, nothing less. She sees the little flowers that bloom in the starkness of the desert. She wonders how the wild flowers that are not seen my men can know the joy that their song expresses. The wild flowers have a wonderful lesson to teach. They offer themselves willingly with no one to appreciate them. They sing their joyous song to the Lord, happy to love Him alone, even though they are never loved or appreciated by anyone else. They know God loves their song. We are like the wildflowers, like the droplets, like the beautiful white petals of the pear trees I love. There are times the Lord puts us in places of quiet, places where we feel unappreciated, unloved, unnoticed. There are times we feel as if there is no one else who will ever hear our song, will never know how hard we worked or how strongly we held to the tree. Sometimes we wonder at the low places. But it is "good to go low". It is in the low places we find the footprints of our Lord. It is in the shadowed places we begin to hear the songs in the night He writes in our soul. It is in those places, those times that we can know His peace, His joy, His fulfillment unlike anything we will ever find anywhere else. Often, the most wonderful times, the most melodic songs, the most beautiful flowers in our lives come in those times that only the Lord sees and knows. Its the Little Things. . . It has happened several times over the last few weeks. . .I've reached into the dishwasher to unload the clean dishes, except they weren't clean! Yesterday the glasses had a nasty, oily film on them and on the dishes were little bits and pieces of I'm not sure what. I was beginning to become concerned, after all, the dishwasher is fairly new, it should still be cleaning well. The problem didn't seem to be happening every time, either, only some times. Then it dawned on me. Although I had loaded the dishwasher in my usual compulsive manner --not over filled, no dishes piled on each other -- I had forgotten one important element. No matter how hot the water, or how perfectly the dishes were lined up in the dishwasher, they would not be clean without the soap. Hence the oily film and little bits of. . .well, whatever. Life is sometimes like that. We remember the big things. We remember to pray, we remember to read our Bible, to go to church. In fact, we might even make a big deal about those "big" things. But we forget the little things. We forget to smile at that person passing us in the hallway. We forget to make the effort to open a door for someone else. We forget to let someone go ahead of us in traffic. We forget to speak to that person who is alone and lonely. In essence, we forget to put the soap in the dishwasher. I want to be someone who has remembered the little things so much that they almost become a second nature. I know people like that, and I want to be more like them. I want the little things to be as important to me as the "big things." For several years now, this hymn has been a favorite of mine. I love to sing it to myself in times of stress or sorrow. I find the words both encouraging and comforting. The words I first encountered (and the tune somewhat as well) had been altered from the original. In fact, I have found several different variations of the words. For a mother, there is probably nothing worse than when someone hurts one of your children. The natural reaction is to protect them and keep them from harm. If by chance something does happen to hurt them, our "momma grizzly" instinct is to want to fight back. When we see pain and suffering, difficulty or hardship come into the lives of our children (or our own lives for that matter), our first action should be to pray that the Lord would teach them and us all He has for us to learn of Him in the situation. We should ask that His eternal purpose in Christ Jesus would be revealed in these circumstances and that His Son would be glorified. After that, we can begin to ask or seek for the resolution of the difficulty or pain. But by desiring to remove every pain and hardship from their lives -- or ours -- we are actually seeking to remove that which often works the greatest knowledge of the Lord. Doesn't it seem true that we come to know the Lord the most during the darkest and most difficult times in our lives? I have been off work from the hospital for several weeks after having hand surgery. This week I have had to go to the hospital, though, for several meetings. While there, Glen waited for me so we could continue on to other appointments or meetings. Today, after my meeting, I glanced down toward his feet. The grass clippings from his shoes gave him away. I knew where he had been during my meeting. He had spent the hour at the driving range. Now, I have no problem with this, in fact, I highly encourage him to enjoy some time in this recreation. My point is that where, and with whom, we spend our time will always show up in some way, shape or form. Those we are with will somehow rub off onto us. Those things with which we immerse our brains, will come out in our speech and our actions. If we fill our hearts and minds with the word of God, we will find those truths coming forth in our speech and in the way we treat others. If we make the circumstances of our days opportunities for prayer, we will find praise issuing forth from our lips and our hearts more spontaneously. My husband didn't even realize he was leaving a small trail of grass clippings, it was just a natural consequence of where he had been. Such will be the life that follows hard after God, His words and His life in and through us will be the spiritual consequence. Just go to the beach and try to avoid it. You'll find it gets everywhere. . . on Image by angela7dreams via Flickryour feet, on your clothes and in your car. 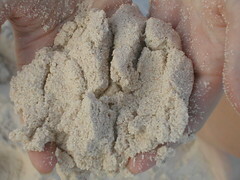 Take a handful of sand and look at it closely. Now try to count each grain of sand. You might want to sit down, it's going to take some time. are Thy thoughts unto me, O God! With names such as Maloney, Newlin, Paggott, Cowan and Donaldson in my family tree, having an Irish heritage is a serious thing to me. Although my father's father was from Greece, my father's maternal grandfather came here from Ireland. His grandmother's family also boasted Irish roots, as well did some from my mother's family. We are nearing the time of year when every one wants to be Irish and this will reach a fever pitch on March 17th as the world celebrates Saint Patrick's Day. The Shamrock in the picture was sent to me from my cousin Rebekah who will be celebrating St. Patrick's Day this year by getting married. The shamrock is the quintessential icon of Ireland, but many don't know why. 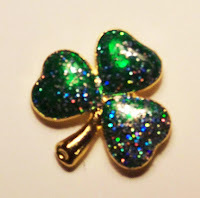 I'll explain it to you and it will explain why I am wearing this very shamrock pin as I type this. When Patrick wanted to share the concept of the Trinity with the Irish, he used the shamrock. 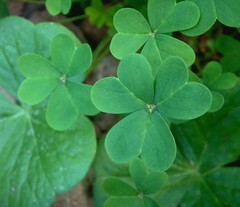 Patrick would hold up a shamrock and challenge his hearers, "Is it one leaf or three?" "It is both one leaf and three," was their reply. "And so it is with God," he would conclude. Image by cobalt123 via FlickrThis is the same thought process I used to share with my three-year-old granddaughter this weekend. Using clover from our yard, I explained to her that God was one God, but He God the Father and Jesus, God the Son and also God the Spirit. But He was still one God. I also pointed out to her that the petals each looked like little hearts, which reminded us that no matter what, God always loves us and that if we trust and believe in Him, He will come into our hearts to stay forever. I showed her the little ring of white toward the center of the clover and explained that a circle has no starting point or ending point and God had no beginning point and has no ending point. "For there is no other God, nor ever was before, nor shall be hereafter, but God the Father, unbegotten and without beginning, in whom all things began, whose are all things, as we have been taught;and His son Jesus Christ, who manifestly always existed with the Father, before the beginning of time in the Spirit with the Father,indescribably begotten before all things, and all things visible and invisible were made by Him. He was made man, conquered death and was received into Heaven, to the Father who gave Him all power over every name in Heaven and on Earth and in Hell, so that every tongue should confess that Jesus Christ is Lord and God, in whom we believe. And we look to His imminent coming again, the judge of the living and the dead, who will render to each according to His deeds. And He poured out his Holy Spirit on us in abundance, the gift and pledge of immortality, which makes the believers and the obedient into sons of God and co-heirs of Christ who is revealed, and we worship one God in the Trinity of holy name."